Kleefeld on Comics: On Strips: First Dual-Duty Creator? One of the many challenges in working as a comic strip artist is the daily grind of it. Although things have changed enough in recent years so that it's no longer mandatory per se, but the general rule is that they have to churn out a new strip seven days a week, fifty-two weeks a year. A new strip with a new idea every single day. That's no easy task. So when someone comes along to work two strips...? Well, that is certainly an impressive feat. You've also got team-up efforts that would seem to make the increased workload of a second strip more mangeable. Mort Walker (who was already working on Beetle Bailey) collaborated with Dik Brown (already working on Hagar the Horrible) to develop Hi and Lois together. Tom Batiuk (after working on Funky Winkerbean) launched John Darling with Tom Armstrong and later Crankshaft with Chuck Ayers. Another alternative is to not make the second strip a seven-day-a-week thing. Greg Cravens has been working on The Buckets for several years, and more recently launched the five-days-a-week webcomic Hubris. Mike Peters does Mother Goose & Grimm every day, but his editorial cartoons are only twice a week. So it's not unheard of to work on two strips simultaneously, but it's clearly an effort. But my question is: who attempted this first? Who was the first comic creator to work on more than one strip at a time? Well, I haven't done an exhaustive analysis, but I'm currently putting my money on Winsor McCay. His first strips were published in 1903. He tried a couple different titles, but they didn't last very long. His first real success was Little Sammy Sneeze which debuted in July 1904. While still working on that, he launched Dream of a Rarebit Fiend in September of that year. In January 1905, he began The Story of Hungry Henrietta (not one of his more popular strips) and in June, he started A Pilgrim's Progress By Mister Bunion before finally getting to Little Nemo in Slumberland in October. 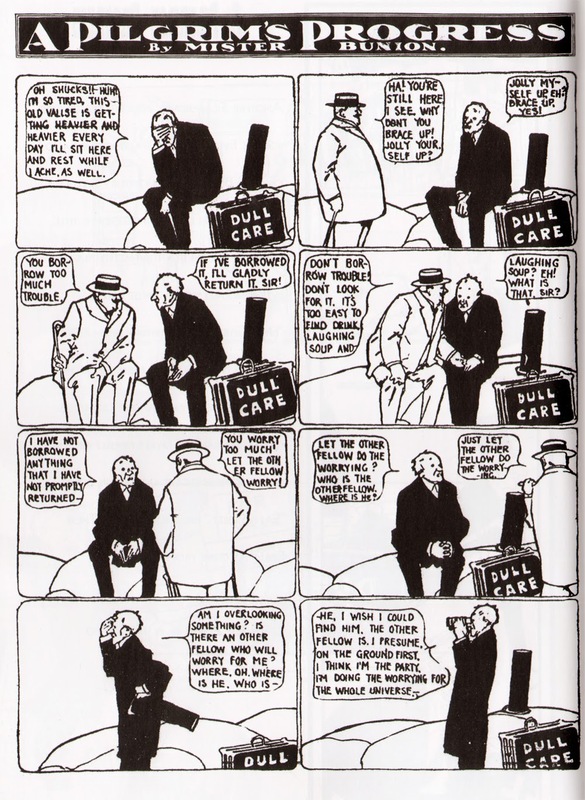 The only strip McCay dropped during this timeframe was Hungry Henrietta so at the tail end of 1905, he was working on four different strips simultaneously. He continued that throughout 1906 before dropping Sammy Sneeze (so he could do a 4,000 cell animation by himself) but he continued on with the other three strips through 1910. Now, granted, these weren't all daily strips, but they were more detailed and considerably larger than anything you'd find today (often taking up a full newspaper page by themselves). Other earlier cartoonists certainly worked on multiple strips in a serial nature, but does anyone know of any cartoonists working multiple strips simulatenously? You've got my gears grinding trying to think of early comic strippers who were doing more than one feature… My knee-jerk reaction is that there were lots of them, but I'm baffled when I try to name someone. You might think of Jeff MacNelly, who was doing editorial cartoons, Shoe and Pluggers all at the same time. I haven't double-checked that he did all of them at the same time, but I think he did. Just for a point-of-fact, though- I launched Hubriscomics.com as a three-strips-a-week feature, and was talked into running five-a-week on gocomics, since I had fourteen months until the two sites synched up. Now both run four a week. Not relevant, but there you go, anyhow. There is Bill Holbrook, who does On The Fastrack, Safe Havens, and Kevin and Kell. The first 2 I read on King Features, the last on it's web page. All have been going for years. There is some overlap with the first 2, with some characters showing up in both.